If the Good Lord had wanted us to enjoy ourselves, he wouldn’t have granted us his precious gift of relentless misery. 1 We use another of our wait_for invocations, this time with assertTrue. 2 is_displayed() tells you whether an element is visible or not. 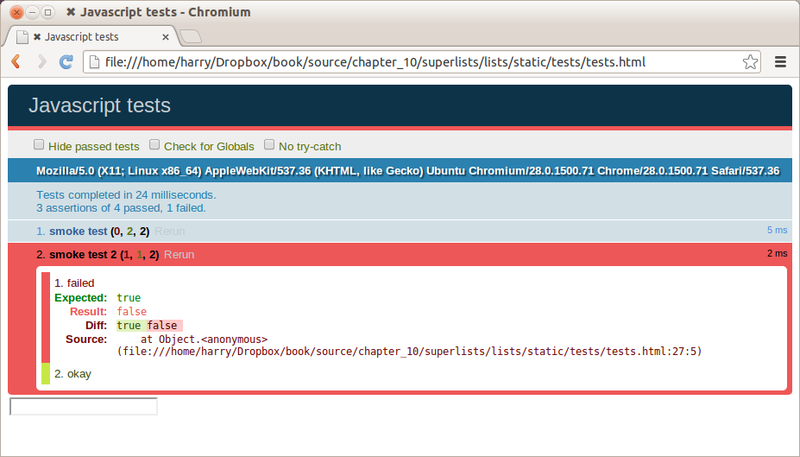 We can’t just rely on checking whether the element is present in the DOM, because now we’re starting to hide elements. I like to keep helper functions in the FT class that’s using them, and only promote them to the base class when they’re actually needed elsewhere. It stops the base class from getting too cluttered. YAGNI. "You've already got this in your list"
And we can commit this as the first cut of our FT. Choosing your testing tools in the Python and Django world is fairly straightforward. The standard library unittest package is perfectly adequate, and the Django test runner also makes a good default choice. There are some alternatives out there—nose is popular, Green is the new kid on the block, and I’ve personally found pytest to be very impressive. But there is a clear default option, and it’s just fine. In the end I decided we should use QUnit because it’s simple, has a similar look and feel to Python unit tests, and it works well with jQuery. Dissecting that, the important things to pick up are the fact that we pull in qunit-2.6.0.js using the first <script> tag, and then use the second one to write the main body of tests. If you open up the file using your web browser (no need to run the dev server, just find the file on disk), you should see something like Basic QUnit screen. 1 The QUnit.test function defines a test case, a bit like def test_something(self) did in Python. Its first argument is a name for the test, and the second is a function for the body of the test. 2 The assert.equal function is an assertion; very much like assertEqual, it compares two arguments. Unlike in Python, though, the message is displayed both for failures and for passes, so it should be phrased as a positive rather than a negative. Why not try changing those arguments to see a deliberate failure? Let’s get a bit more comfortable with what our testing framework can do, and start using a bit of jQuery—​an almost indispensable library that gives you a cross-browser-compatible API for manipulating the DOM. If you’ve never seen jQuery before, I’m going to try to explain it as we go, just enough so that you won’t be totally lost; but this isn’t a jQuery tutorial. You may find it helpful to spend an hour or two investigating jQuery at some point during this chapter. Download the latest jQuery from jquery.com and save it into the lists/static folder. 1 The <form> and its contents are there to represent what will be on the real list page. 2 Here’s where we load jQuery. 3 jQuery magic starts here! $ is the jQuery Swiss Army knife. It’s used to find bits of the DOM. Its first argument is a CSS selector; here, we’re telling it to find all elements that have the class "has-error". It returns an object that represents one or more DOM elements. That, in turn, has various useful methods that allow us to manipulate or find out about those elements. 4 One of which is .is, which can tell us whether an element matches a particular CSS property. Here we use :visible to check whether the element is displayed or hidden. 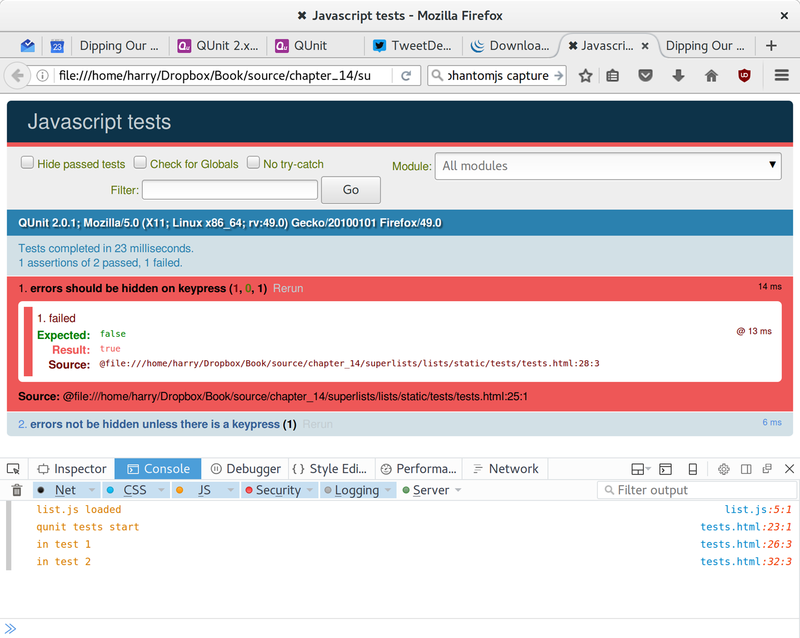 5 We then use jQuery’s .hide() method to hide the div. Behind the scenes, it dynamically sets a style="display: none" on the element. 6 And finally we check that it’s worked, with a second assert.equal. 2 assertions of 2 passed, 0 failed. Slightly unexpectedly, we find one of them fails—​see One of the two tests is failing. What’s happening here is that the first test hides the error div, so when the second test runs, it starts out invisible. 4 assertions of 4 passed, 0 failed. 1 The jQuery .trigger method is mainly used for testing. It says "fire off a JavScript DOM event on the element(s)". Here we use the keypress event, which is fired off by the browser behind the scenes whenever a user types something into a particular input element. jQuery is hiding a lot of complexity behind the scenes here. Check out Quirksmode.org for a view on the hideous nest of differences between the different browsers' interpretation of events. The reason that jQuery is so popular is that it just makes all this stuff go away. 0 assertions of 1 passed, 1 failed. 1 assertions of 2 passed, 1 failed. 1 This line says: find any input elements whose name attribute is "text", and add an event listener which reacts on keypress events. The event listener is the inline function, which hides all elements that have the class .has-error. Rerun the tests, opening up the browser debug console (Ctrl-Shift-I usually) and you should see something like QUnit tests with console.log debug outputs. list.js loads first. So our event listener should be attached to the input element. Then our QUnit tests file loads. But, thinking it through, each test is going to "reset" the fixtures div, which means destroying and re-creating the input element. So the input element that list.js sees and attaches the event listener to will be replaced with a new one by the time each test runs. $ git commit -m"add jquery, qunit tests, list.js with keypress listeners"
1 We explicitly declare an object as a property of the "window" global, giving it a name that we think no one else is likely to use. 2 Then we make our initialize function an attribute of that namespace object. Read more in the jQuery .ready() docs. Write an FT and see it fail. Write a unit test in either language, and see it fail. Write some code in either language, and make the test pass. We’re almost ready to move on to [part3]. The last step is to deploy our new code to our servers. Don’t forget to do a final commit including base.html first! 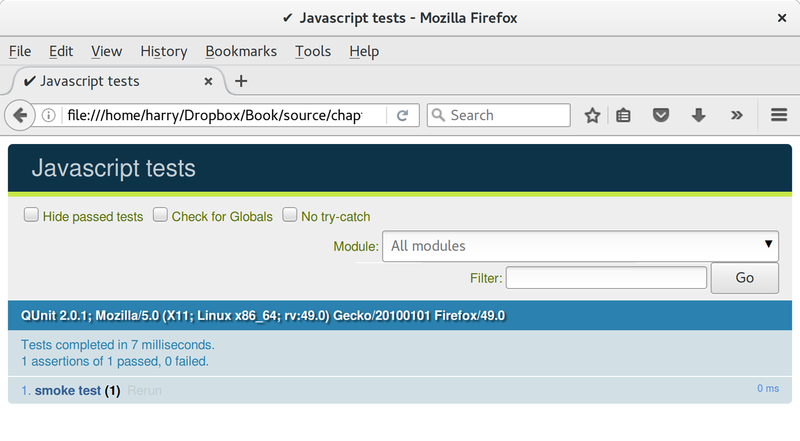 QUnit mainly expects you to "run" your tests using an actual web browser. This has the advantage that it’s easy to create some HTML fixtures that match the kind of HTML your site actually contains, for tests to run against. But it’s also possible to run JS tests from the command line. We’ll see an example in [chapter_CI]. The new shiny thing in the world of frontend development are MVC frameworks like angular.js and React. Most tutorials for these use an RSpec-like assertion library called Jasmine. If you’re going to use one of them, you’ll probably find life easier if you use Jasmine rather than QUnit. understanding and controlling execution order. 1. Admittedly once you start looking for Python BDD tools, things are a little more confusing. 2. Purely because it features the NyanCat test runner.